If you’re running Windows and have an Xbox, you might have considered using Windows Media Player to stream your pictures, videos, and music to your TV. It’s a pretty sweet setup, especially for a home network. The only issue is that sometimes if you have a really large collection or an issue with some of your media files, you can have a problem where the wmpnetwk.exe process takes up 100% of your CPU! Not fun! If you open up Windows Media Player, you might notice that the entire computer slows to a crawl or the program simply crashes. There are a couple of reasons this might happen. First, if you have a very large collection of videos and pictures, let Windows Media Player run overnight if it’s the first time it is indexing all of the files. It can take a long time to update the library the first time around. If you’re getting this high CPU usage even after a couple of days, then you have a different problem. The main reason for the wmpnetwk.exe high CPU issue is due to a damaged media file. This is normally caused by a damaged AVI file, but it doesn’t necessarily have to be. Also, I’m obviously assuming you want to use the sharing feature of WMP. If not, turn off media streaming (Method 3) and that should fix your problem. Here are a couple of ways you can solve this issue. If you want to keep all your media in Windows Media Player, then you should try moving everything out of the monitored folders first and then move small chunks of the media back in and see when the problem occurs. The best bet is to remove all the monitored folders from Windows Media Player, then move all the media to some other location on the hard drive. Finally, go back in and add the monitored folders in again (they should be empty). Check and see if the CPU usage is high. If not, you know your problem is with one of the media files in your library. You’ll have to slowly dump them back into the monitored folders and hope you can figure out which one it is. 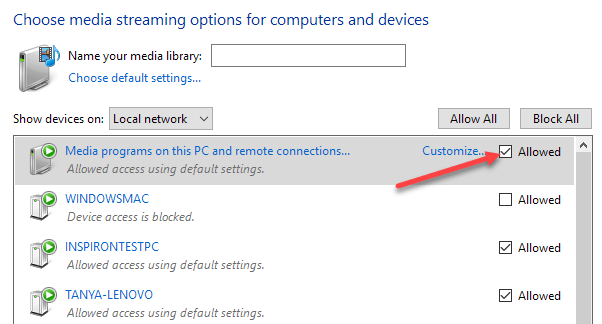 In Windows 7 and 10, you can turn off media streaming by going to Network and Sharing Center and clicking on Change advanced sharing settings on the left-hand side. You’ll see a section called Media streaming, which you can turn off. If your computer is part of a homegroup, then you won’t see the media streaming options here. Instead, you’ll have to click on Start, type in media streaming and click on Media streaming options. Here you will see all the devices on your local network and whether they are sharing or not. At the top, you’ll see the media sharing setting for your computer. You can uncheck the Allowed box to turn off media sharing for your computer in a homegroup. The second way to fix this if that doesn’t work is to set the service to Manual instead of Automatic. 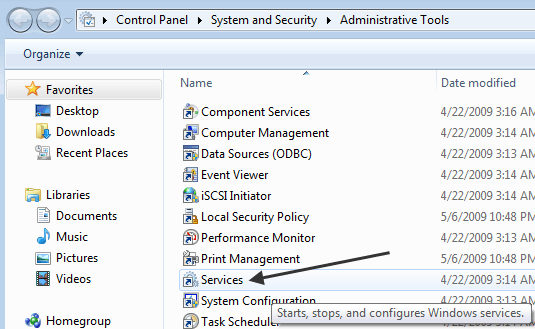 You can do this by clicking on Start, then Control Panel, System and Security, Administrative Tools, and then Services. 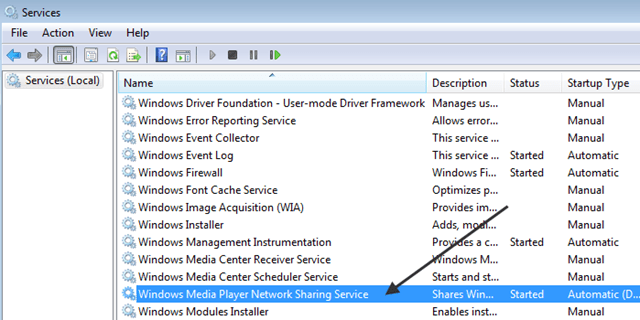 Scroll down to the Windows Media Player Network Sharing Service item and double-click on it. Change the Startup type from Automatic to Manual. Then click OK to save the settings. Go ahead and restart your computer and see if the problem has gone away. If not, you can do the same steps above, but choose Disabled instead of Manual. 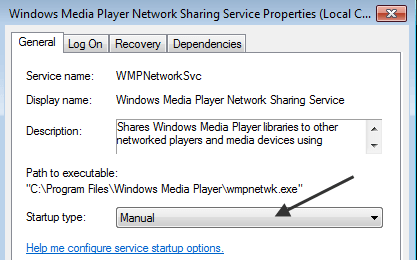 However, only set it to manual if you don’t care to stream media from your PC to your TV using Windows Media Player. Enjoy!